Bill writes, "I subscribed to get Blue Ray disks thinking I may get more new releases that way. 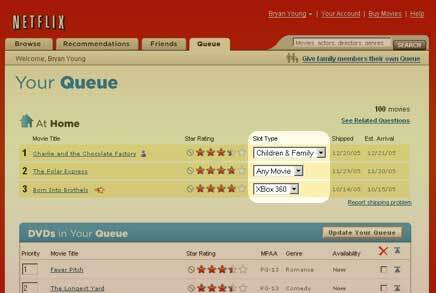 I think you should have an option that says ship whatever is available Blue Ray or DVD. Now you can only pick either DVD or Blue Ray. Why not be able to ship whichever one is available. I really don’t care which I get. What is more important to me is getting the next DVD I have in my queue." What do you think? Should Netflix offer the ability to ship the first available format? David sent in an interesting idea: "I watch quite a few TV series via Netflix (Sopranos, Wire, Deadwood, etc). However, because the timing for the release of programs sometimes follows no rhyme or reason, I have to remember to check every now and then to see if there's new material available. It would be helpful if Netflix offered a option that allowed you to indicate that you want to put all future episodes of a series in your queue. No more trying to figure out when the next batch of Galactica's might be released; I'd be "subscribed" to Galactica, or whatever series interests me, and it would show up in my queue automatically." Do you have any suggestions for Netflix? I would like the ability to designate slots in my queue for specific genres. In the past I've wanted to make sure 2 of my 5 movies were television shows (without the added hasle of re-ordering my queue each time I sent a movie back). I solved this by creating profiles for movie lists and television shows. This isn't a good solution, since the ratings and recommendations are not shared between profiles. In the future, as Netflix added other media types (games, high-definition DVDs, etc) slots could be designated for those media as well (maybe at extra cost, in the case of games). I imagine to keep things simple, this feature would only be avialible when turned on by the user in thier account setup. It might be disabled for smaller accounts (encouraging users to upgrade). I've attached a screen shot of a mockup for those who wonder how the UI might change.